Mom… The time has come to stop feeling like an outcast because you’re against spanking, pro-breastfeeding, and anti-junk food! You’re not weird. You’re a special kind of awesome, and what you really need is not criticism but unwavering support. 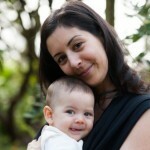 Imagine… A community where attachment-minded mothers support each other without judgment. Any time of the day, you can blow off steam to women who immediately get you. And can help you. Because they’ve been there too. I’ve got many moms just like you waiting to welcome you into our tribe. Immediately. You are not the only mom who’s uncomfortable with the topic of breastfeeding at playdates because you’re pretty sure you’re the only one who thinks it’s awesome to breastfeed for years instead of months. You can talk about it freely with the Nourished Village, even if “talking about it” means asking how to wean your child gently. You’re not alone getting mad whenever someone posts another ridiculous pro-spanking post, saying it taught them to be respectful, and “they survived”. You are not alone being the odd one out at school, with your goldfish-lacking lunchboxes. The Nourished Village moms are often singled out at school because they just do NOT understanding why kids are being fed cupcakes and gummy bears all day long. Navigate the dangerous waters of junk food filled classrooms with other moms who get you! You are not alone wondering if there’s an alternative to just giving your kids antibiotics when they get the sniffles. Around here, we love talks of probiotics, elderberry syrup, manuka honey, and all that good stuff! We’re not against the medical community, but we like to know our options! You are not alone feeling like your life would be so much easier with a supportive community. Before the Nourished Village, most of our members felt isolated and longing for mom friends who get them. Their wish came true. And you are not alone feeling like you can’t vent on Facebook because your child’s friends’ moms are there too, and so is your husband, and your mother in law, and the playdate mamas who are fun to hang out with but don’t necessarily get you. Vent away! We’re here to listen, and everything you say stays within the virtual walls of the Nourished Village. I was feeling just as overwhelmed as you are when my first boy was born. I swore I would not live my life feeling unhappy, and I vowed to help other moms out there regain their happiness too. I’m delighted to say that I succeeded on both fronts. No woman starts out her mothering career thinking she’d be spending her days waking up already drained, counting the minutes until dad comes home, breathing to 10 a million times a day, and wondering why on earth raising children is so darn hard. And yet… Many of us find ourselves there. We don’t need to be! The key solution? A loving, thriving community where you feel at home. A mastermind of moms you can reach to who make you understand that everything will be OK. The Nourished Village was created just for you, the mom who wears many hats and would be earning 6 figures if only she were compensated for all the work she does! 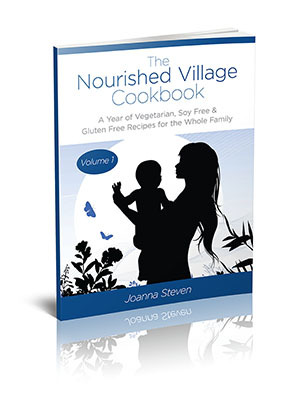 Each volume is a treasury of 100% gluten free, 100% vegetarian, with designed-for-you meal plans created by myself, Joanna Steven, mom of 2 who has been pregnant or breastfeeding non-stop since 2010, and professional, classically trained chef Heather Pace. 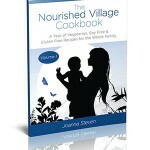 Heather Pace and I continuously create exclusive, delicious recipes for the Nourished Village. There are no skimpy detox meals featuring tiny salads and watery smoothies. All recipes are nutrient dense, delicious, 100% vegetarian, and 100% gluten free. These are recipes your children and partner will really love and thrive on! This sensational collection is full of interviews with some of the best luminaries in peaceful parenting and mama bliss. We’re talking awesome people like Laura Markham, Janet Allison, Carole Marie Downing, Nadine Artemis, and more added several times a year. And we’ve got access to the greatest minds in the business, so we can interview most of YOUR favorites. Just ask! Because rainy days are only fun when you want to get out and get wet, these ideas will keep you and your children entertained and busy even if you have to stay home. 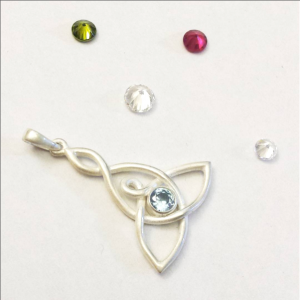 They made great gifts for loved ones when you’re done! Includes seasonal and themed craft projects for a variety of ages. Gift #5: The 20 minute meditation recorded by PROFESSIONAL musician and singer Victoria Leith, exclusively for the Nourished Village. Who is Joanna Steven? Joanna Steven is an Amazon best selling author, creator of the popular program Remineralize Your Body Now, and full time mom to 2 boys age 5 and under. She tried for years to be Super Mom – think working from home, making her family 4 nutritious meals a day from scratch, being a loving wife, practicing her own version of Attachment Parenting, and more. Along the way, she learned many lessons – sometimes the hard way. She wants to share what she learned with you. You, too, can experience the bliss and rewards of raising children without compromising on your values – and without losing your sanity in the process! The time has come for moms to stop feeling lonely and misunderstood, and SKYROCKET your happiness levels (and your kids’) instead! The time has come to have JOY be the dominant emotion of your mothering career. Joining the Nourished Village has made all the difference for our members, and these moms will be your best allies starting right now! PLEASE NOTE! The Nourished Village is open only a few times a year so we are able to make YOU feel special, catered to, and welcome on a totally personal level as soon as you join.